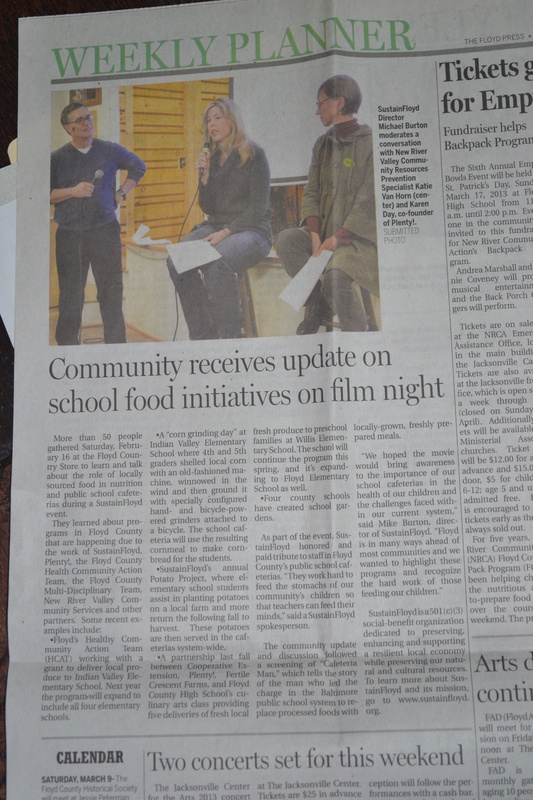 More than 50 people gathered at the Floyd Country Store to learn and talk about the role of locally sourced food in nutrition and public school cafeterias during a SustainFloyd event. SustainFloyd partners with a series of other community organizations to carry out programs that promote healthy nutrition, the use of locally grown food in public schools and education about how food gets from farms to the dinner table. The community learned about programs in Floyd County that are happening due to the work of SustainFloyd, Plenty!, the Floyd County Healthy Community Team, the Floyd County Multi-Disciplinary Team, New River Valley Community Services and other partners. As part of the event, SustainFloyd honored and paid tribute to staff in Floyd County’s public school cafeterias. They work hard to feed the stomachs of our community’s children so that teachers can feed their minds. That week the Floyd County Multi-Disciplinary team delivered fresh fruit baskets to all of the school cafeteria workers as a token of thanks.